Light chemical peel / micro peel – Subtle improvements at first, but that healthy glow will increase with more treatments. A combination of alphahydroxy acids and beta hydroxy acids, such as glycolic acid, are used. All of these chemicals are the mildest choices. You can repeat these treatments to achieve your desired results. Medium chemical peel – Your skin will be noticeably smoother and fresher looking. Acne scars, deeper wrinkles and uneven skin color can all be treated with a medium chemical peel. Trichloroacetic acid (TCA) is most oftenbused for medium depth peels. TCA when used for this type of peel will remove skin cells from both the outer layer of skin (epidermis) and upper part of your middle layer of skin (dermis). You may repeat a medium chemical peel every few months to maintain your new glowing skin. Deep chemical peel – Results are dramatic, but recovery takes the longest.If you have deeper facial wrinkles, skin that’s damaged by the sun, scars, areas that appear blotchy, or even pre-cancerous growths, deep facial chemical peels might be the right choice for you. 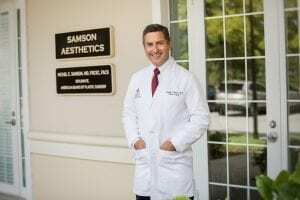 Dr Samson uses the strongest chemicals called phenol and croton oil to penetrate down to the lower dermal layer of your skin. For this type of peel, you may need a local anesthetic and a sedative to manage any discomfort. A chemical peel is usually a very safe procedure when performed by a qualified and experienced plastic surgeon. It happens infrequently, but you could develop an infection or scarring from chemical peels. For people with certain skin types, there is a risk of developing a temporary or permanent color change in the skin either lightening or darkening. Use of hormone medications or a family history of brownish discoloration on the face may increase the possibility of developing abnormal pigmentation. If you have suffered from cold sores (herpes) in the past, there is a risk of reactivation. Be sure to ask Dr Samson to prescribe medication to try and avoid an outbreak. There is increased risk if you have a history of keloids (scar tissue overgrowth) or any unusual scarring tendencies. You are likely to experience some mild redness, skin flaking, and irritation from a light chemical peel for a few days. Recovery is rapid, and after repeated treatments, these side effects will likely subside. When trichloroacetic acid is used in a medium chemical peel, you’ll experience some redness, stinging and skin crusting just like a light chemical peel. Although these chemicals won’t bleach your skin, you may see some color changes. Peeling and swelling lasts longer than in a light peel, and is usually complete in 7 days. You’re advised to avoid the sun for several months to protect that fresh new layer of skin. A deep chemical peel requires that you have an adequate recovery time. You may return to work and some of your normal activities two weeks after treatment. At that point, your skin will be healed enough for you to wear makeup. Deep chemical facial peels will result in peeling, crusting, skin redness and discomfort for several days. Dr Samson may provide painkillers to keep you comfortable. Although the swelling is likely to disappear in about two weeks, your skin may remain red for up to three months. One treatment with a deep chemical peel will produce long-lasting and dramatic results that can last up to 10 years. The cost of chemical and micro peels varies depending on the type of treatment you choose, the extent of the treatment, and other factors. Dr. Samson can give you an accurate cost estimate for your specific needs during a one-on-one consultation. In order to achieve a more complete aesthetic appearance, some patients opt to have another cosmetic surgery done in conjunction with chemical peels. Such procedures may include facelift, eyelid and liposuction surgery. To get an idea of the results you can achieve with chemical peels, view Dr. Samson’s chemical or micro peels before and after photos.